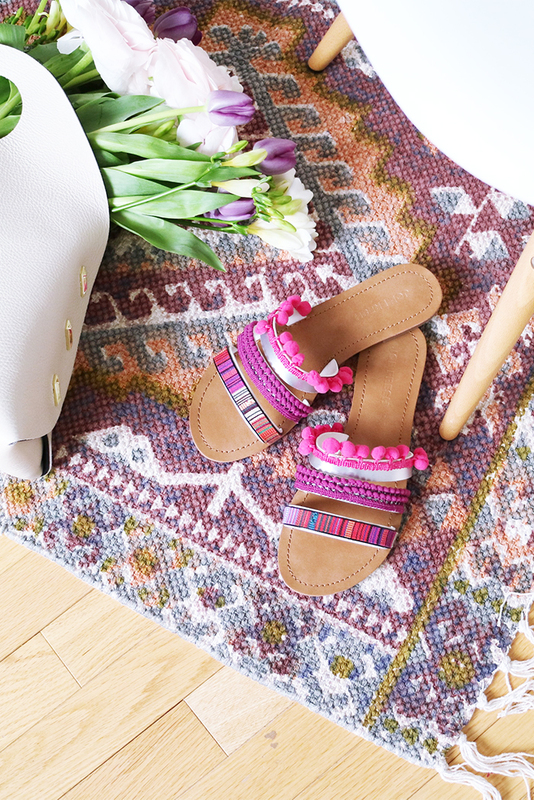 Can you have enough pairs of basic sandals during the summer? The answer is no, of course! I love pairing them with maxi dresses and they’re great to toss in my tote bag in case I decide to take a long evening stroll after work. I decided to give my two pairs of Joe Fresh sandals a dose of glam by customizing them with faux pearl beads and assorted trims. The results were awesome! 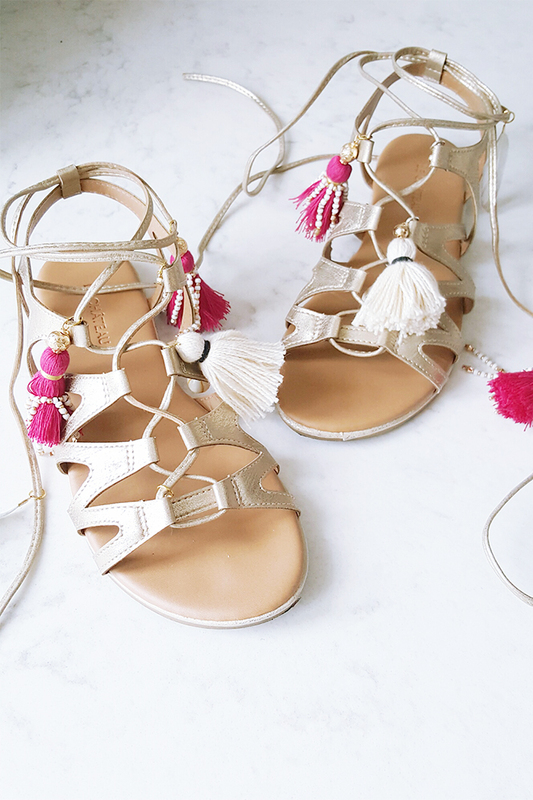 Keep reading to see the full how to and where to shop for these DIY summer sandals supplies! Woohoo it’s finally denim jacket season and that makes me so happy! Denim jackets are perfect for the warmer season and they pair so well with just about anything (well besides more denim that is). I like the fact that they add an instant casual vibe to any summer dress. This season, I went with a slightly unique option. I opted for a longer length style and also decided to add a few personal touches by customizing it! I promise, this DIY patchwork denim jacket couldn’t get any more dummy proof. Keep reading to see where to shop the best patches and appliques! I love love love everything about Gucci’s embroidered collection of items. From their bags, dresses, denim, and shoes, I am totally smitten! If you’ve been following along on Instagram, you’ll know that I pulled the trigger late in the Summer and purchased the Gucci Princetown leather slipper because ever since the first time I laid my eyes on the rose embroidery, I knew we were meant to be! I’ve been seeing more and more embroidery patchwork pop up all over stores and online and since I couldn’t justify spending more on another statement piece (at least not for another couple of months!) I did what any DIY enthusiast would do, I recreated my own pieces! It’s been awhile since I worked on a fashion DIY project and I’m SO excited to share these Gucci inspired denim with you! I posted up a short DIY video tutorial below, it’s my first one would love to see what you think. Keep reading below to see how you can create your own pair of Gucci Inspired Embroidered Denim! I partnered with Joe Fresh, to come up with stylish takes on the classic monogram. Come try them out at the Queen + Portland store in Toronto during the month of September, where you can custom monogram your Joe Fresh purchase for $5. I love stocking up on basics for Fall. I gravitate towards solids and richer colours and look for transitional pieces that match the changing weather. 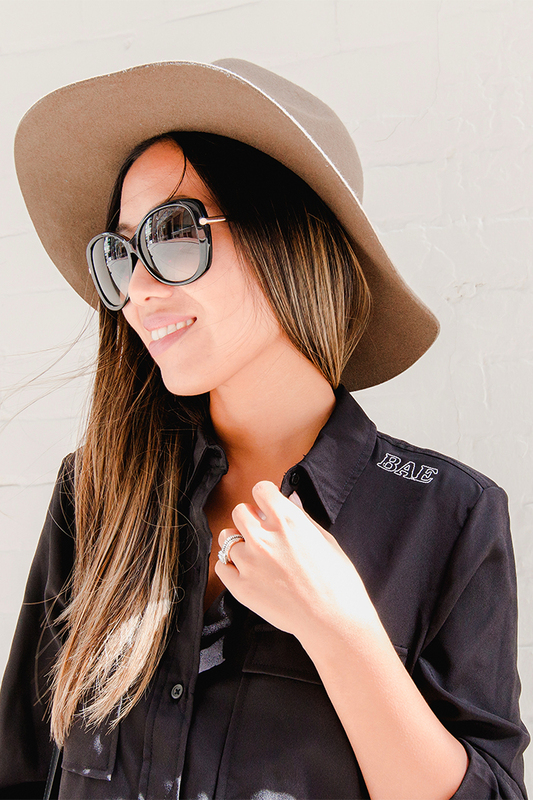 Layering a classic denim jacket over a T-shirt, or sporting a midi shirtdress paired with a wide brim fedora, are two of my go-to looks for the season. As a DIY enthusiast, I’ve always enjoyed adding personalized details to my wardrobe, especially when it comes to basics. It’s my way of exercising my inner creative flare—such as with monograms. Read further to see my custom monogram designs from Joe Fresh! I’ve always been a fan of Gladiator style sandals. I remember when I visited Greece last year, I saw a huge variety of styles. Athens and Santorini offered styles that reminded me of ancient Greece meanwhile, on the swanky island of Mykonos, boutiques were carrying sandals that were embellished with colour beading, fringes, pom pom trims, and tassels. I’ve been seeing a variety of embellished styles pop up all over Instagram, most of them, designed and decorated by talented artists and fashionistas. So naturally, I had to attempt a pair myself. I picked up these gold Gladiator Sandals from LE CHATEAU last month and finally had the chance to embellish them! Read further to see what items I used to make these DIY Tasseled Gladiator Sandals..
It’s been some time since I worked on a fashion related DIY and I’m excited to share this fun yet simple project with you! 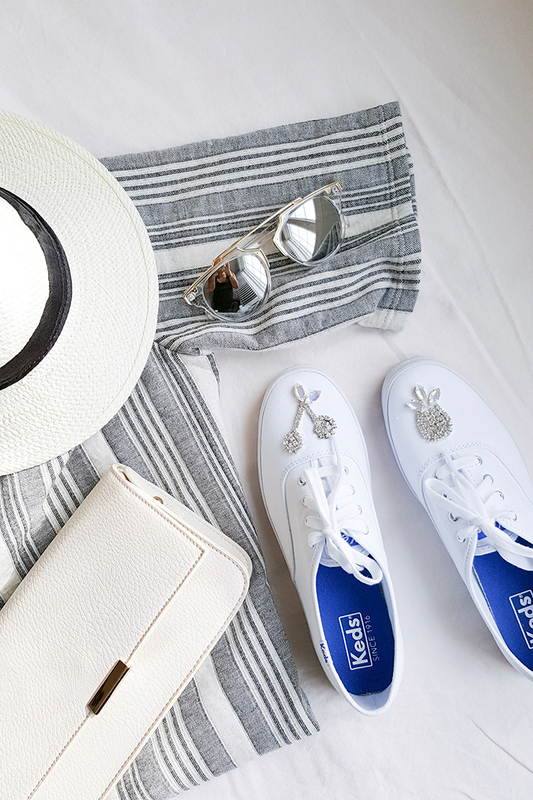 Nothing beats a pair of classic white Keds for Summer and I’ve partnered with SoftMoc to show you just how easy it is to customize a pair of your own! I was inspired by fun pineapple and cherry prints that I’ve been seeing in stores as of late and created an ‘adult’ creation by using fancy and sparkly rhinestones for my DIY Keds shoe design. I loved how they turned out! Not only are these DIY Summer Rhinestone Keds perfect for Summer but they are 100% one of a kind! This post appeared originally on the Joe Fresh Blog – Fresh Edit. Spring is such a beautiful season. The roads will soon be tree-lined and gardens blooming with colour. 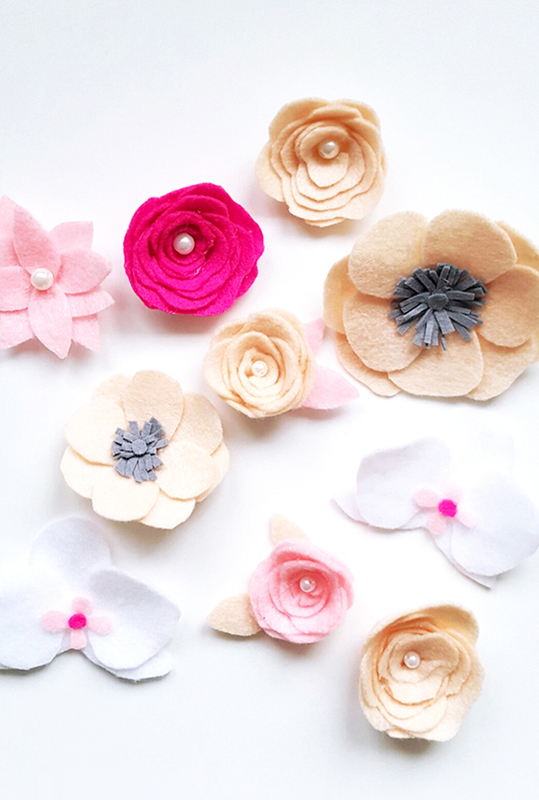 What better time to decorate your favourite Joe Fresh designs with your own DIY felt flowers. They add the perfect finishing touch to a straw bag, blouse or even jeans. Decorate your favourite Joe Fresh designs with pretty floral embellishments. I partnered with Joe Fresh to show you how to add a touch of true love to your favourite Joe Fresh designs with this easy DIY project. This post originally appeared on Joe Fresh Post. Valentine’s Day is around the corner and I think it’s a great time to channel the spirit of love into something fun and stylish. I love Valentine’s Day. It’s a great time to celebrate the simple acts of love with the special people in your life. If you’re looking for ways to spread some Valentine’s Day appreciation, try your hand at this effortless heart-print paint technique to embellish those Joe Fresh basics! These are 100% washable and loveable! This post originally appeared on the Joe Fresh Post. Fall is the best time to stock up on denim! They pair fantastic with cozy sweaters, basic buttons ups, and ankle booties, all of which are my favourite fall wardrobe items. I’ve recently been smitten by a more relaxed fit and absolutely adore the Boyfriend Cut. With the many emerging rich fall hues, I couldn’t help but to add a punch of colour to my own pair of Boyfriend Cut denim from Joe Fresh with the ever so popular burgundy colour. My abstract painted denim was inspired by garden roses, what a great piece of summer I can take alongside with me into Fall! Whatever you may be inspired by, follow my simple steps to create your own pair of abstract painted denim. Greetings from Boston! I’m spending the week in Boston attending a digital marketing conference. I love visiting this city, it holds such a special place in my heart as we got engaged here last Summer. Just because I’m out of town doesn’t mean I’ve forgotten about you! I know many of you recently either started a new school year or perhaps sent your little ones back to school, therefore, I wanted to share this super, simple DIY project with you that’s perfect for the BTS and Fall season. I’ve once again teamed up with SoftMoc to see just how amazing a pair of basic shoes could be transformed with a little bit of creative. Earlier in the Summer, I tackled a pair of Gold Leaf Birkenstock Sandals, this time, I added an extra girly detail to these black Converse Sneakers! These DIY Lace Converse Sneakers were modified with some extra lace crochet fabric I had in my closet (actually from an old dress) alongside with some fabric glue. The result? Chic! 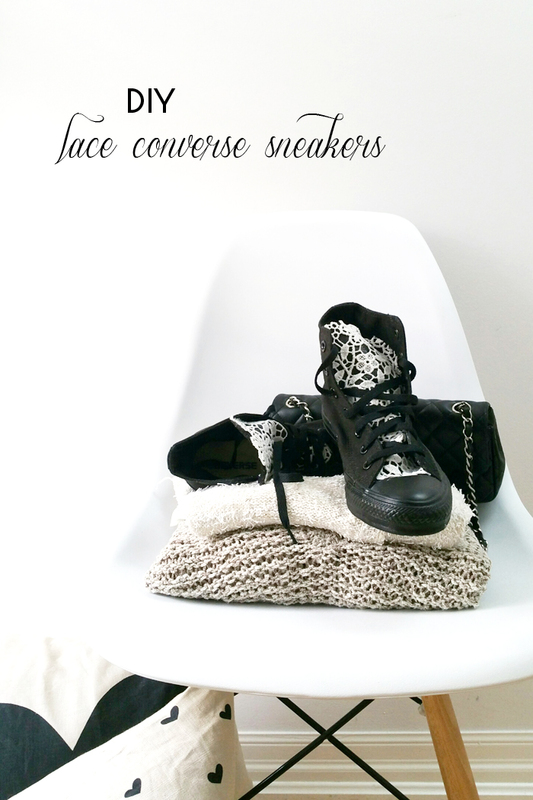 Read further for the full tutorial and don’t forget to check back next week to WIN a $100 SoftMoc gift card to shop your favourite pair Converse!